My dad retired last month. I still can’t believe that he is no longer working. He is incredibly active but so far he seems to be keeping busy in his retirement. The weekend after he retired we through a surprise retirement party for him. My mom had the idea to make him 3 cakes, one for each of his hobbies. I thought that was a great idea a readily agreed. The only problem was that the cakes took a lot of time and I worked everyday the week before the party. I managed to make the carrot cake Thursday night but when I went to remove them from the pans one turned out beautifully and the other broke into pieces. I was incredibly upset and was even contemplating buying a cake mix for the next day. Thankfully I had a 2 hour delay Friday morning so I was able to get up early and make the cake. When I got home from work I frosted it and decorated it. It turns out that the carrot cake was the favorite at my dad’s party. 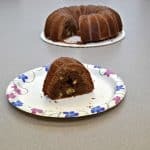 Everyone loved the fruit, nuts, and carrots that filled this cake. It was full of flavor and it looked pretty good too. This week our theme for #SundaySupper is Cheese, Cake, and Cheesecake so I couldn’t wait to share this cake with the group. We were able to share cheese dishes, cakes, or cheesecake! What a wonderful combination of foods. 1. Preheat the oven to 325 degrees. 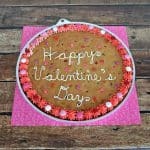 Butter two 10″ round cake pans and flour the insides. 2. In a large bowl combine the flour, baking powder, baking soda, cinnamon, nutmeg, and salt. In a medium bowl combine the carrots, nuts, coconut, and raisins. 3. In the bowl of a stand mixer beat the sugar, butter, and oil together on medium speed. 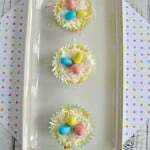 Add the eggs one at a time and continue to beat until the batter is smooth. 4. Reduce to mixed speed to low and add in the flour mixture, mixing until just combined. Remove the bowl from the bowl and fold in the carrots, nuts, coconut, and raisins. 5. Bake for 45-55 minutes or until a toothpick inserted into the middle comes out clean. Place on a cooling rack and let cool for 5 minutes. Run a knife around the sides of the cakes and unmold them. 6. Invert the cakes and remove them from the pans. Invert and cool to room temperature. 7. To make the frosting combine the cream cheese and butter together in the bowl of a stand mixer. Beat until smooth. Gradually add the sugar and beat until the frosting is smooth. Beat in the vanilla. 8. To assemble the cake put one layer on a cardboard cake round. Spread frosting on top of the cake then place the second layer on top. Frost the sides and the top of the cake with the remaining frosting. Top with chopped nuts or coconut if desired. Make sure you check out what the other #SundaySupper members are cooking up this week! Carrot cake is probably my favorite cake of all times…and now I’m craving it for breakfast!!! 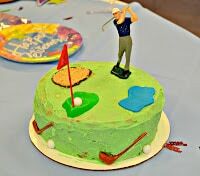 What a wonderful cake for your dad the golf themed touches are perfectly executed!! I love carrot cake! I’ll take it any chance I can! YUM! We love carrot cakes here and your cake looks fantastic!I love the frosting and the lovely golf course :)Gorgeous!!! Oh my goodness I love carrot cake and this cake is absolutely ADORABLE! What nice cake for your dad’s retirement. Great idea about decorating them with the theme of his hobbies. As I’m carrot cake fan, I’d love to give your version a try upon my return from Japan. What a sweet idea! I love carrot cake and this looks like a great recipe! That is the most adorable carrot cake I have ever seen! I love it!!!! What surprise when you cut into it! 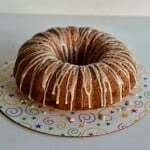 You can’t go wrong with a good carrot cake and your looks divine. I am sure dad loved it!! Awww, girl, I feel your pain at the broken cake. I always end up doing things last minute and it’s so devastating when something like that happens cause I usually don’t have that much time (or the energy) to make something else. You pulled through like a total pro and the end result is amazing! I love carrot cake and your decorating job is unbelievable. Love it! A classic Heather I love the golf theme! What a fun party for your dad and you came through like a trouper despite the setback. That is one festively beautiful cake! Tell him congratulations on his retirement! Oh yes your carrot cake looks pretty rich in healthy nuts and fruits, Great job! You have to know I am a huge carrot cake lover, in fact my mum said ones that I must have carrot cake in my blood. I ought to try your recipe soon! What a great job with a decoration and this cake sounds fantastic! 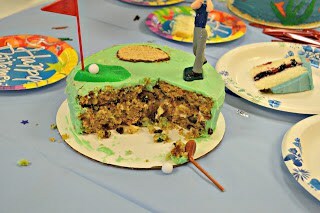 I love the golf-themed cake…so much talent in this group! And I love that it’s carrot cake…one of my faves. Thanks for sharing!